1. 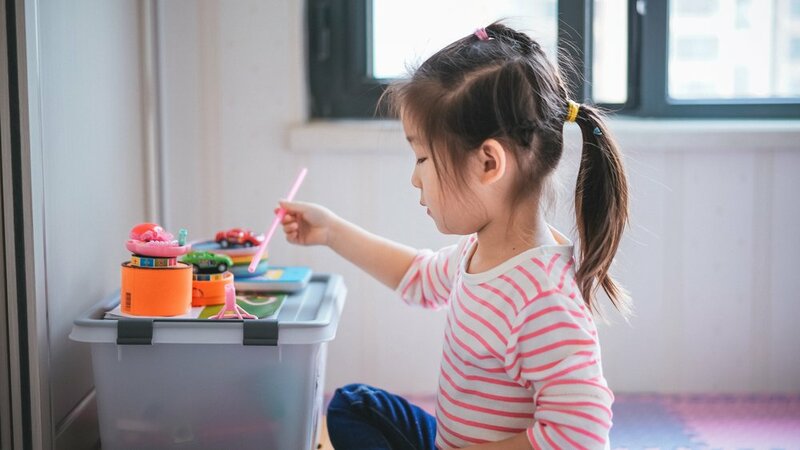 Storage spaces: everyone needs one ~ Your child is entitled to have their own space to store their things, where they are undisturbed from the daily activities of the household. Take a closer look at whether your child’s things are mixed up with your own or another member of the household. For instance, is any of their clothing stored with yours? Are their books in the same space as yours? If they have siblings, and the items are not shared, are their things stored together? Are their toys living in communal spaces like the on dining room table or kitchen counter? One of the benefits of giving a child their own clearly defined spaces within the home is that they know where their things belong, they feel a personal sense of ownership over that space, and are more likely to keep it tidy. 2. Be a role model ~ If your children see you enjoying tidying tasks, they will view tidying with positivity and enthusiasm. Practice tidying daily; fold your laundry in front of your children and allow them the opportunity to ‘help out’ by giving them smaller items to fold; let them see you return your things to their home after you finish using them; and tidy their items with them. When your children see you valuing a tidy space and taking time to tidy up, they will naturally copy your behavior over time. 3. When sorting, allow your child the freedom to choose which of their belongings they want to keep ~ KonMari™ is a positive process: instead of focusing on how much we want to get rid of, the focus is on the items we want to keep in our lives which we love, the things that ‘spark joy’. For children, I call this process the ‘happy check’. If you’re sorting clothes for example, encourage your child to take each item in their hands, one at a time, and decide whether the item makes them happy. If it does, put it on the ‘keep pile’ and if it doesn’t, say goodbye to the item before putting it on the ‘donate’ or ‘recycle’ pile. Allowing your children the freedom to choose, will build their confidence over time and eventually, through practice, saying goodbye to items that no longer bring them joy will become second nature. 4. Teach your children how to fold ~ KonMari™ focuses on folding clothes, and storing them upright, as the main storage method. Not only does this create a lot more space, it allows you to reconnect with your items every time you fold them. For children, this is a great introduction to expressing appreciation for their items every time they fold them as well as encouraging them to put their things back in their place once they’ve been folded. Start small; socks are the simplest item to fold. Once they’ve mastered the sock fold, they can move on to other items of clothing. 5. Store like items together ~ Children’s storage doesn’t have to be beautiful and labeled; to organise well, all you have to do store items of the same type together and give them a home. Clear plastic boxes are a great way to store children’s toys for example, as you can see the contents at a glance and the lid creates a limit on the amount of toys that exist in that subcategory. The beauty of the KonMari Method™ is that you only have to decide where to put things once; when every item has a home, children can form the habit of putting things back in their designated place once they’ve finished with them.